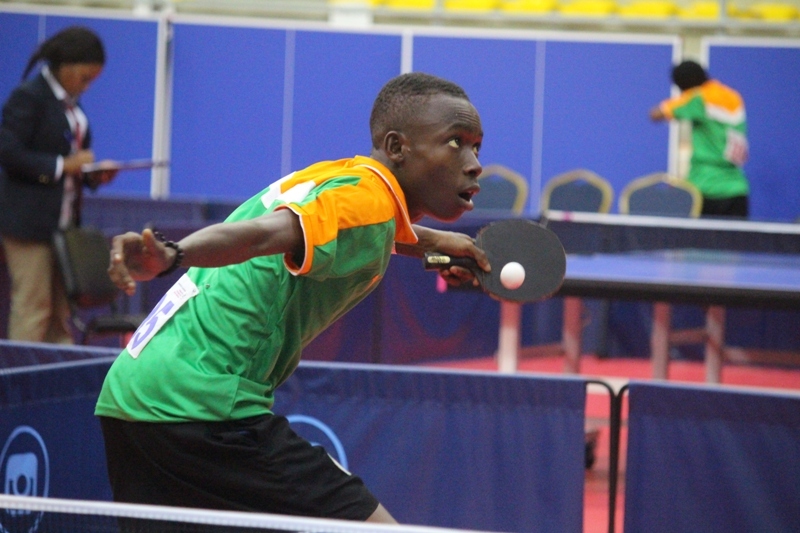 Cherif Gbane is the fans’ delight at the ongoing World Junior Circuit in Abidjan but the 16-year-old who failed to make it to the podium is not giving up on his dream of becoming the best. His progress to the main draw of the junior boys’ singles category was stalled when Chérif Gbane lost to Ziad Elshawaof Egypt by (8-11, 9-11, 9-11) and to his compatriot – Nomel Sie also by (5-11, 8-11, 8-11). Relegation to the Consolation category it was, but to every opportunity given, Chérif Gbane had to make the best out of it. A podium finish was the end results. Victory he claimed after three consecutive victories over Jean Pierre Bayala, Emmanuel Beugre and Michel Ange Seri. Against Jean Pierre Balaya, he won three games to zero (11-2, 11-5, 11-9), while defeating Emmanuel Beugre (11-7, 6-11, 11-4, 12-10) to set up a final encounter with Michel Ange Seri. It was a final worthy of praise as both lads displayed great skill and understanding of the game. Eventually, Chérif Gbane defeated Michel Ange Seri by three games to one (11-8, 11-3, 9-11, 11-9). “This is my first international competition and it has really helped sharpen me. I would be very grateful if I am given an opportunity to go for internship in China or any other country with facilities and coaches to develop me into a better player,” said Chérif Gbane. “I have learnt a lot from this tournament. When I watch the Egyptians play, I see that there is a very big gap between my play and how they play. This means that I have to put in a lot more effort to get to the top” Chérif Gbane. “I want to dedicate my performance to the people of Cote d’Ivoire, especially our table tennis president for putting this tournament together and making us exhibit our talents. One day, we will bring medals to our nation,” an optimistic Chérif Gbane said.